ROSEAU, Dominica, Nov 3, CMC – Hurricane battered Dominica is celebrating 39 years of political independence from Britain on Friday with Prime Minister Roosevelt Skerrit urging citizens not to be daunted by the tasking of rebuilding the island. Hurricane Marie hit Dominica on September 18 as a Category 5 storm, killing at least 28 people and leaving billions of dollars in damage. Unlike previous years when nationals were honoured for their contribution to the socio-economic development of the island, this year’s national awards ceremony has been postponed to next year. 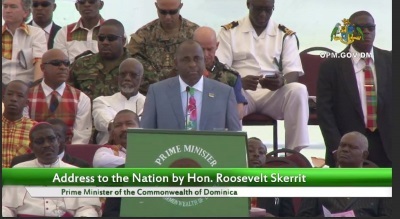 In his address to the nation marking the independence celebrations, Skerrit said that the Dominica ‘is still standing” despite facing the “fiercest floods, the most ferocious winds. “We are sorrow-stricken; we swallow hard, but it still catches in our throat; and we are still standing! Difficulties envelope every aspect of life, uncertainties swirl; and we are still standing! The outside world wondered aloud whether this is the kind of devastation from which you don’t recover. We are still standing. He told the Independence Day rally at the Windsor Park Stadium attended by thousands of people that how the island responds to the storm “will define us, will make us; will become us. “In this solemn moment, let us all, Dominicans who reside here or abroad, let us chose today to renew our pledge to the service of Dominica, her people and to all humanity. Let us together renew our pledge to fight poverty and ignorance; build a prosperous, progressive nation; and to invest in institutions that safeguard justice and opportunity for all. Skerrit said that the day following the hurricane he witnessed “total destruction” adding “I saw corrugated iron mangled and tossed aside, with everything else as if we had been ransacked by a giant burglar. “I sensed uncertainty spiralling. I smelled fear. I also breathed in the deep indefatigable determination of the vast majority of our people to carry on and stand up. When faced with grave danger humans have evolved an instinct to fight or flee. We chose to fight! We chose to rise”. He said he is confident that people who would have fled the island after the storm as they did in 1979 when Dominica was hit by Hurricane David, would soon return. “Sometimes it takes a crisis to remind everyone of the importance of our journey. Remember, you only see the stars clearly at the darkest hour. Ladies and Gentlemen, on this our Independence Day, Dominica stands forth on the edge of a great triumph to come, on the edge of a triumph not just for Dominica but for the world. Skerrit said humanity’s development has shaped Dominica and the island’s response must help to shape humanity’s course. “It will be a measure of the maturity of our independence of its meaningfulness if we are brave enough and wise enough to accept that the challenge of our time is global warming and climate change. We must therefore grasp the opportunity to make a difference to the world to shine a light onto the right path for our planet. But he also acknowledged that the task before the island is “formidable,” adding “we have lost an estimated 200 per cent of our GDP (gross domestic product) and our goal is to rebuild better not just to replace what was lost. Skerrit outlined new plans for the re-development of the island saying there are moves to establish the Climate Resilient Economic Agency of Dominica, (CREAD) to support the rapid implementation of the plans once they are funded. He said following his visit to the United States, London and Brussels over the last few weeks over 50 per cent of the funding needed to rebuild the island had been forthcoming and that “we will be presenting our plans to a partners conference in New York later in the month to help raise part of the rest. We will support the private sector as it rebuilds and restores. “We will facilitate insurance pay-outs the importation of rebuilding materials the forbearance of lenders and clamp down on price gouging. For the balance of the resources we are pursuing innovative financial instruments that link the restoration of the rain forests and protection of our marine environment to new resources for rebuilding.